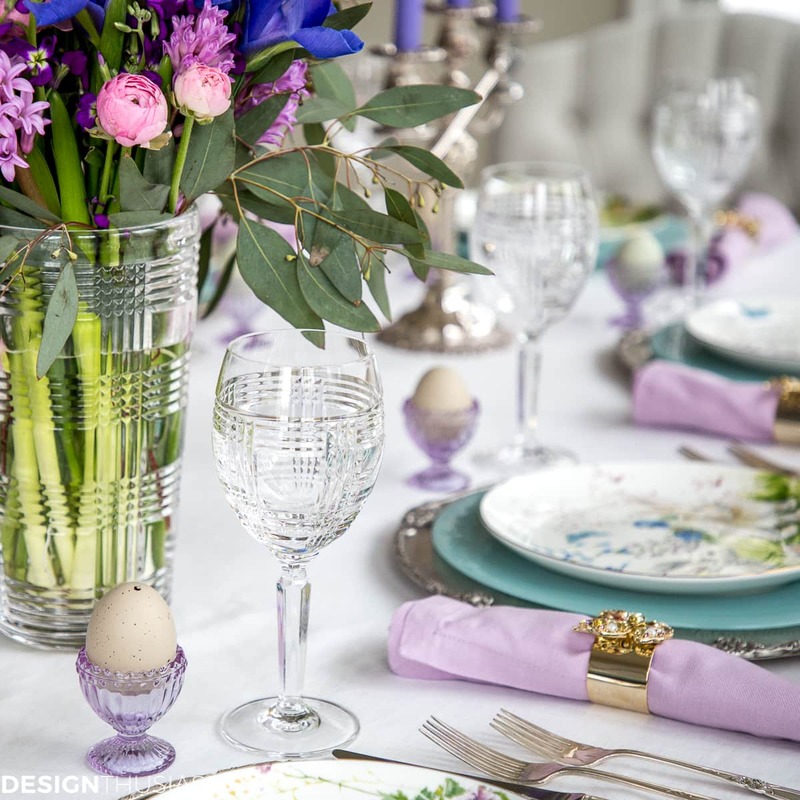 Today I’m teaming up with some talented bloggers to share with you some Easter entertaining ideas, hosted by Lory from DesignThusiasm. 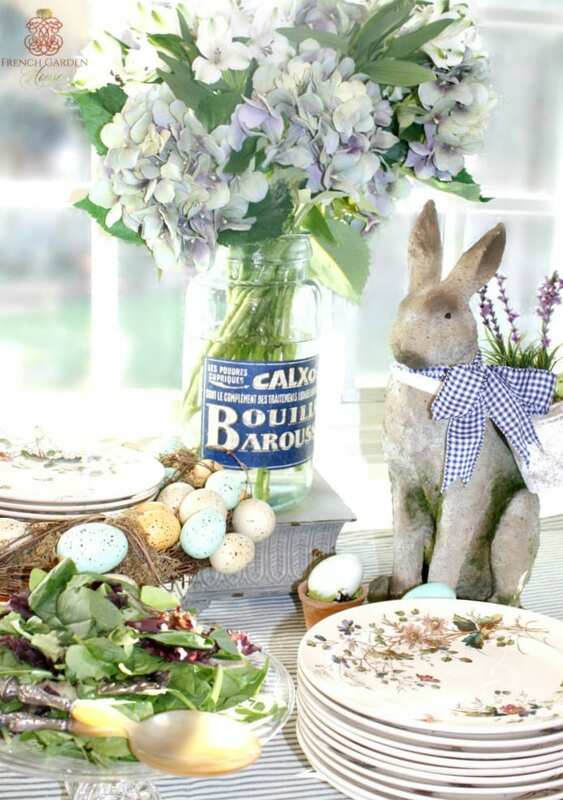 More specifically, I’ll be sharing a simply navy blue and white Easter Tablescape. If you’re stopping in from French Garden House, welcome! At the end of the post, I’ll share all of the other creative Easter entertaining ideas, sure to you inspire you for the coming holiday! The first thing you may notice is the change in artwork on the walls. I recently found this oversized navy blue abstract art at HomeGoods and I’m in love with it! 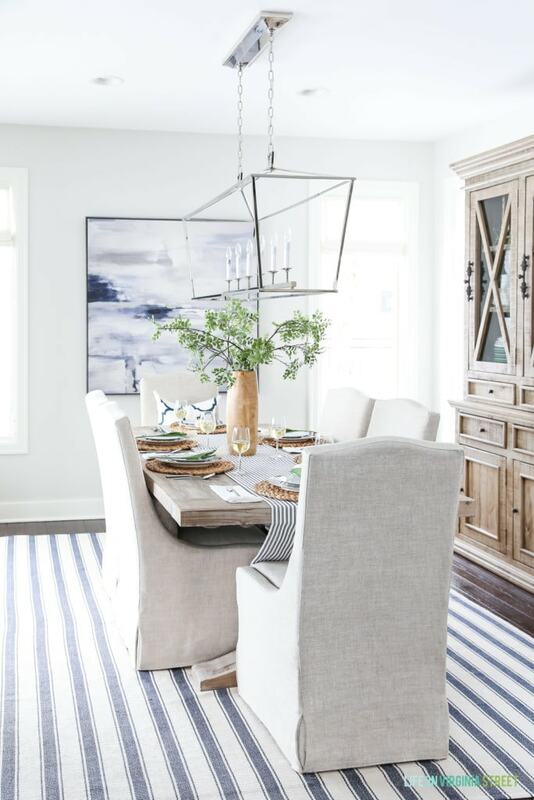 The scale is so much better for this space, and I love the contrast the rich navy brings to the room. 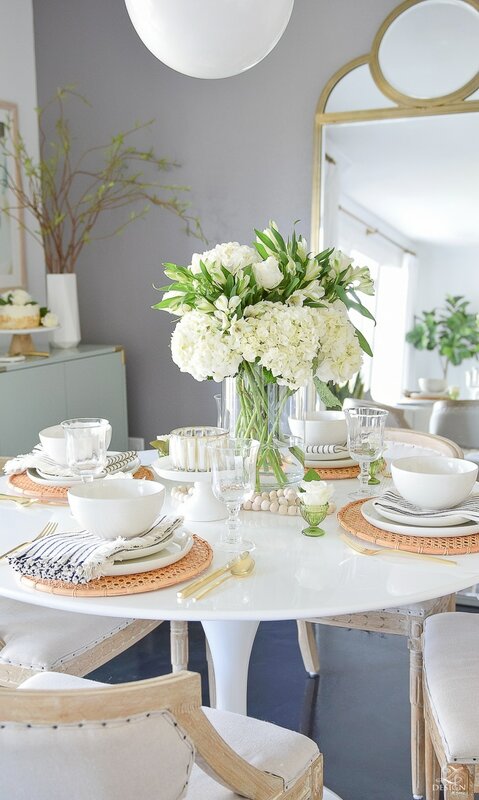 With that, I decided to keep my Easter tablescape similar tones – my usual navy blue and white! I’ve linked a few similar art options below. For reference, mine is 49″x49″. Click any of the images to learn more about each item. To keep all the navy blue and white from feeling too cold, I added in some warm tones like the wood vase and the seagrass chargers. 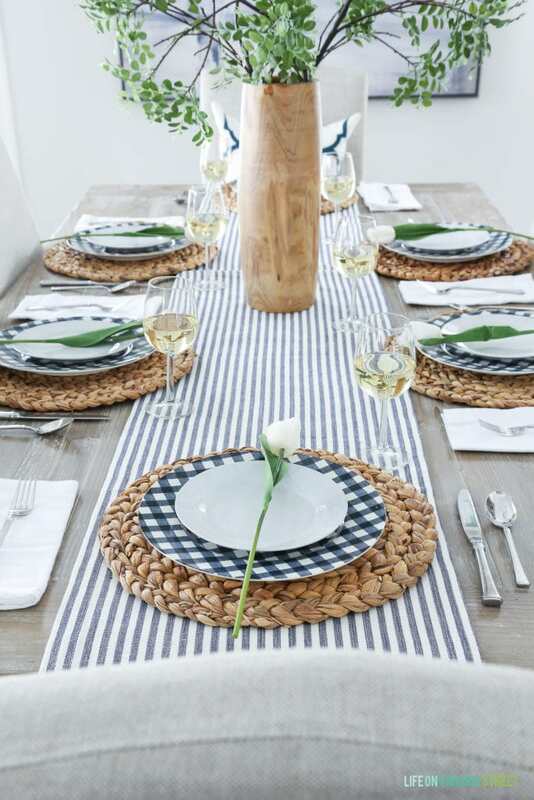 They pair perfectly with these navy gingham plates that I just can’t get enough of. I honestly had a hard time picking among all the cute color options, but ultimately the navy blue won out. I used a lot of competing patterns, but since they are all in the same navy blue and white color palette, I feel like it all works together without feeling overly busy. And if you love our light fixture, but not the accompanying price tag, be sure to check out my Darlana knock-off recommendation and review! As much as I love fresh flowers and greenery, they aren’t always a great idea with our cats. 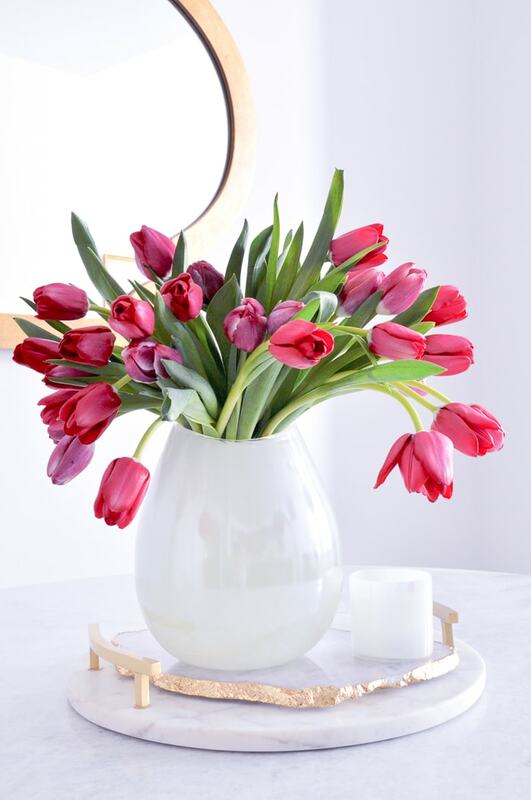 That’s why I’m loving these faux greenery stems (I have three in this vase) and these faux tulips. 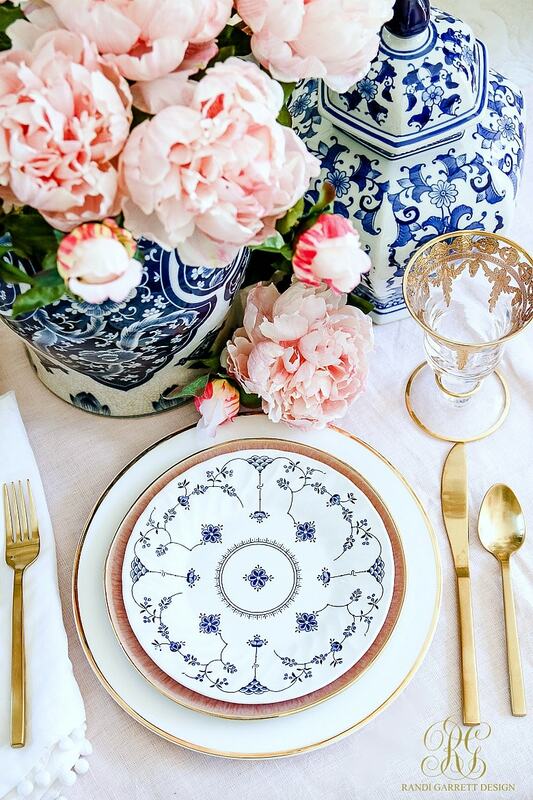 Both look rather life-like and work perfectly for tablescapes when fresh flowers aren’t available or an option. 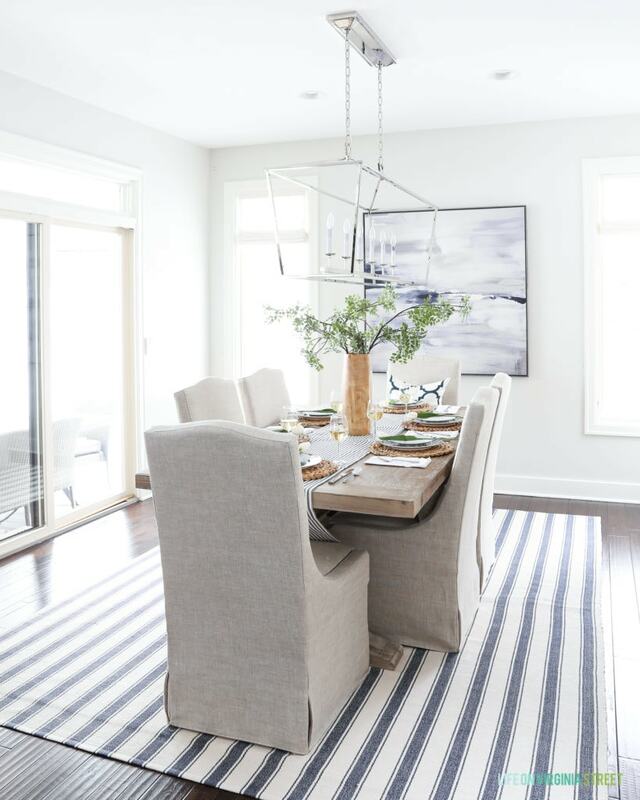 And they look so cute against the striped table runner! I’m loving this simple look that could just as easily be used for any spring occasion as it could for Easter! 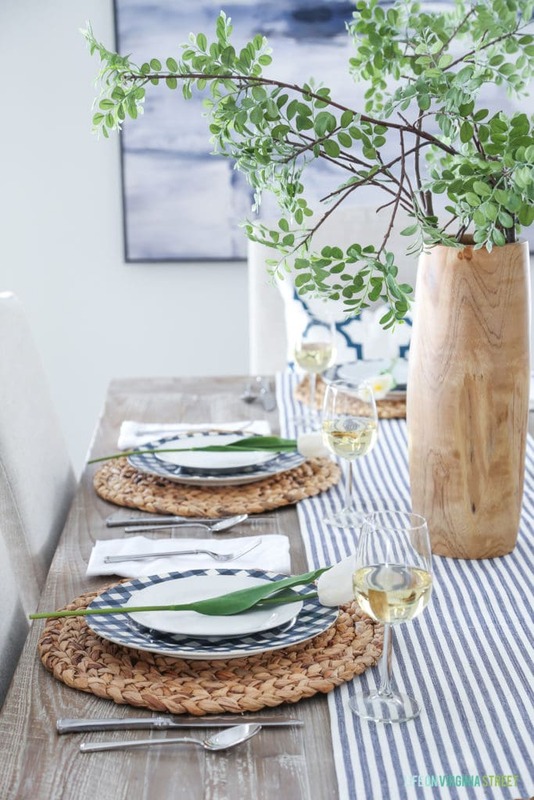 I hope you enjoyed my navy blue and white Easter tablescape! The next stop on the tour is Jen from Decor Gold Designs . Be sure to stop by and check out her gorgeous Easter flower arrangement! I’ve also included links below to all the other stops on the tour. So much inspiration and wonderful ideas! Love this! It has me dreaming of spring so badly! Beautiful! How many stems did you use for your vase? I absolutely LOVE the picture from Home Goods! 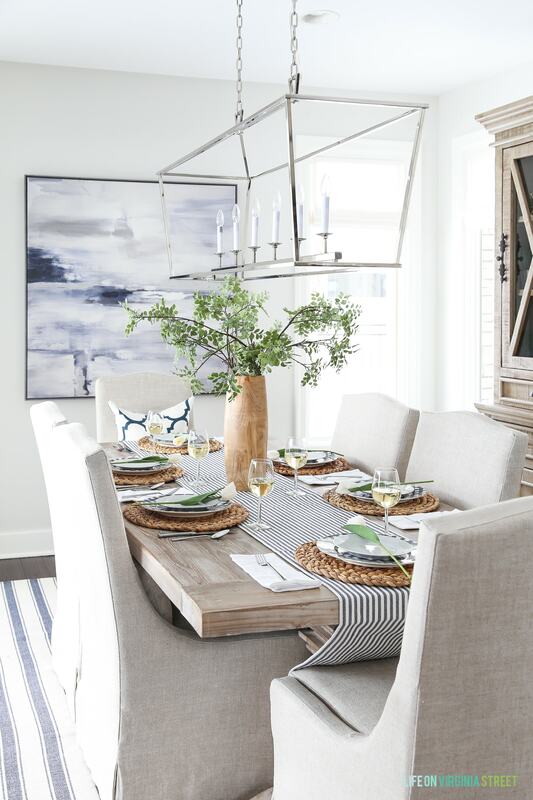 Looks great in your dining room. So pretty! I love that wood vase – where did you find it? Searching all over for my kitchen. Thank you! I actually got it at Target a year or two back. But here’s a nearly identical one I found recently: https://rstyle.me/n/czfg4775re. I hope that helps! 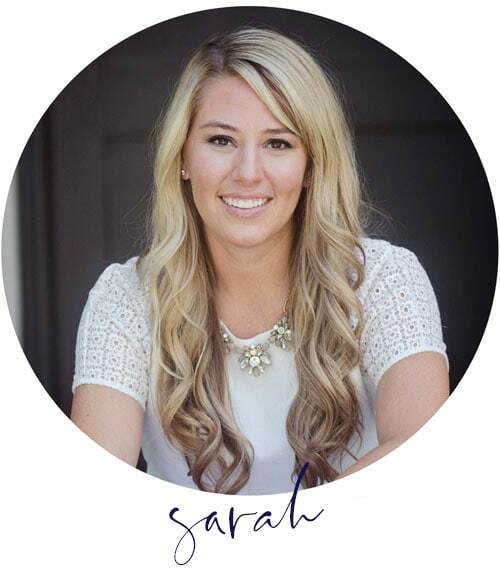 Sarah, it’s just stunning. 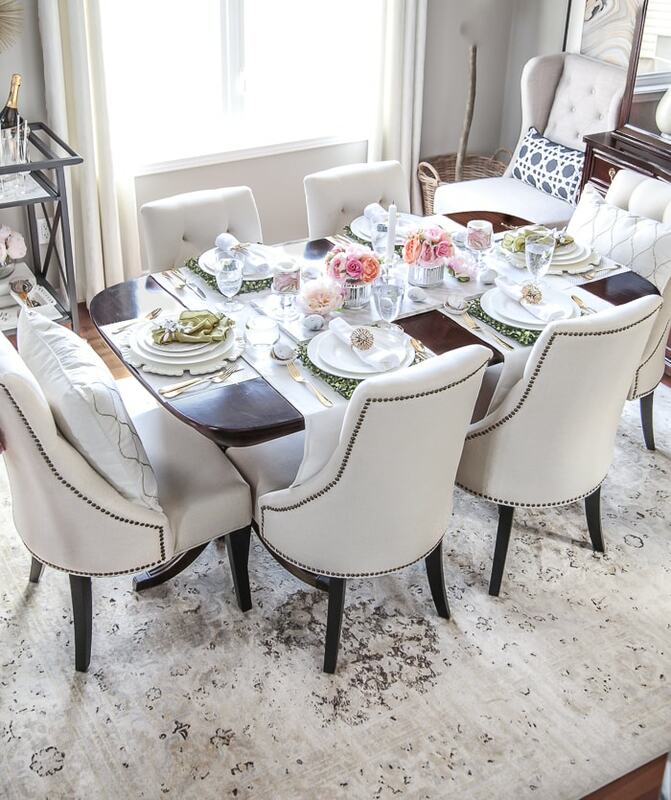 I looooove your dining room and it’s styled perfectly for Easter. 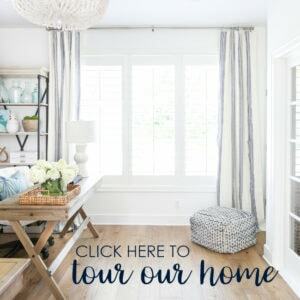 So nice to meet you – just stumbled across your blog while looking for “nautical” or “coastal” table scape images to show off to our cusotmers for inspiration. Great job! I am a year late but I am in LOVE with that vase! I have searched high and low. Can you help me find one similar? I love your blog!! Sorry for the delay in getting back to you! I’ve been searching for a while now, but this is the closest I’ve found (but it’s a bit darker): https://shopstyle.it/l/0KSB.